Steve Jobs retired last week. Steve Jobs had incredible impact as Apple CEO as well as a cultural icon whose products re-shaped and re-defined our relationship with technology. 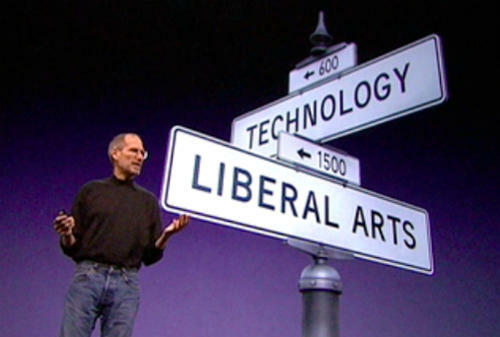 Steve Jobs’ retirement reminds those in technology that a liberal arts view to their work could serve them better. It might be a stretch to say Apple is everything Microsoft isn’t. Well, the two companies have had a distinctly different approach to their products and different strategic paths through their existence. Technology and people. People and technology. Since last week’s announcement, of all the articles I read on Jobs, I was most taken by The Genius of Jobs, Marrying Tech and Art from The Wall Street Journal’s, get this, Life & Culture section. In the presentation, he illustrates that point through an image of the intersection of two streets; to your, and to his left. This humble blog’s perspective? 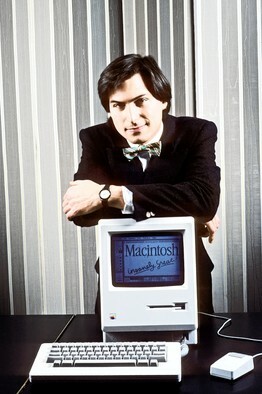 Thank you Steve Jobs. When is the last time you sat with someone from your technology department who made the way Steve Jobs articulated? Today, most strategy relies on technology. The disconnect is that too often technology shows too little commitment to the end-user experience. The enterprise end-user or as the customer end-user. Let me clarify that last sentence, the enterprise end-user is also a customer. Imagine your Information Technology (IT) department committed to an end-user experience similar to Apple’s iPad, the iPod, or iTunes end-user experience or your IT department producing products that are an intuitive joy to work with. Imagine an IT department that creates products and services that make you say, “wow”, not “why bother”? Well, there’s your challenge IT: bring a bit more humanity into your function. There is too much information in information technology and too little liberal arts. Perhaps increasing the latter will yield results that “make our hearts sing”. Technology and people. People and technology. Microsoft and Apple? Are the differences as simple as Bill Gates and Steve Jobs? In their book Putting the Public back in Public Relations authors and technology bloggers Deirdre Breakenridge and Brian Solis wrote, “social media is 10% tool and 90% sociology“. Let’s start more conversations this way. Let’s start more designs this way. Let’s start more requirements this way. That fusion that Jobs espoused and developed at Apple always bring me products that make me happy. Last night I downloaded Lion OS on my MacBook Air. I ventured the new mail set up and loved it. It felt that someone gave me a gift that I needed. Obstacles, though subtle, dissolved. I have counted on Apple for 26 years and this latest OS tells me that can still satisfy me and make me so happy. End-user adoption is a great concept, I am coming closer and closer to calling change management end-user adoption because so many Information Technology and high-tech projects seem to define strategy.